The cell phone accessories retailer is offering customers immediate access to Apple’s iPad 3 (“the new iPad”) cases and accessories at competitive prices. Be the first to accessorize your new iPad 3! We know how much our trend-setting, tech savvy customers value staying at the forefront of technological innovation. We support their investment by providing them with a great selection of new iPad 3 accessories that they can order anytime, anywhere. Avid Apple fans may have endured a long and anxious wait for their new iPad 3, but they need not stand in line to order their new iPad 3 accessories from EverydaySource.com, the online cell phone accessories retailer. “We know how much our trend-setting, tech savvy customers value staying at the forefront of technological innovation. We support their investment by providing them with a great selection of new iPad 3 accessories that they can order anytime, anywhere,” said Jack Sheng, EverydaySource.com CEO. The debut of the new iPad 3 and its crowd-moving popularity has boosted demand for tablet accessories. EverydaySource.com offers new iPad 3 owners useful protection for their investment with a variety of iPad cases: trendy silicone cases, professional leather cases, and sleek TPU rubber cases. The new iPad 3’s retina display can be safeguarded by screen protectors that counter glare and prevent scratches. For those devoted users who need more than the ten hour battery life on the new Apple device, car and travel chargers ensure a steady source of battery life on-the-go. Although the new iPad 3 has taken center stage, interest in the iPad 2 remains strong and steadfast. Apple fans who may be looking to take advantage of the discounted iPad 2 can also keep their tablets fashionably protected. EverydaySource.com has an existing inventory of bestselling iPad 2 cases and accessories to match customers’ diverse styles and tastes. 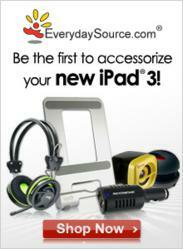 EverydaySource.com prides itself as a one-stop-shop for quality electronics. Its product offerings include cell phone accessories, iPhone accessories, iPad accessories, HDMI cables, MP3 accessories, video game accessories, camera accessories, printer ink and toner, and much more. EverydaySource.com’s daily specials and frequent site wide discounts make it easy for shoppers to save money, while enjoying a hassle-free shopping experience. The commitment to customer-centric service has lead EverydaySource.com to the #3 globally ranked eBay top-rated seller spot, backed by over 2 million positive feedbacks.